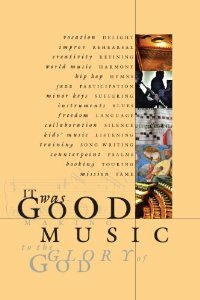 It Was Good: Making Music to the Glory of God ON SALE: 10% OFF. THIS IS THE LONGER VERSION OF THE REVIEW. THANKS FOR READING. ticket sales and hospitality and education and live concert production. each moment is precious enough to frame. money on such activities –and not just as observers, but as promoters? long after the artists have left the campus. 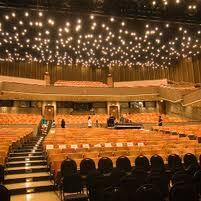 about hosting and producing an excellent show in a quality venue. textures and tones and styles. Giessen-Reitsma’s chapter — is vivid indication of just why It Was Good Making Music to the Glory of God is so very important. This book is a delight to read, a joy, thrilling even, if you are a music lover. But, also, it is important. truth and wondrous artfulness can be found in the most profane of work. church and in the rest of our lives, outside of the sanctuary doors. glorify God as a burden or limitation. But this is simply not the case. of life in full technicolor. you know we stock her Coal Train Railroad CDs and the lovely Rain for Roots: Big Stories for Little Ones CD.) What a thoughtful, inspiring chapter, a so fun to read. pieces centering the whole IWG project. morality tale about fame, and is a treat to read. and the authors are to be commended for this labor of love. this volume already is gathering just such glowing recommendations. we call music and its place in the life of faith. The book covers so much good ground that it is hard to describe — I just want to offer this plea that you buy It Was Good: Making Music right away! (It will, of course, make a fabulous Christmas gift, as does the first IWG volume.) I hope that our readers will trust us on this one. As an added bonus, there is a complimentary link where for free you can go to Noisetrade and download an 18 track album of songs by many of the artists in the book. Yep, you get to hear Drew Holcomb and Joy Ike, Charlie Peacock and Sandra McCraken, The Welcome Wagon and Coal Train Railroad. There are worship songs from strong church composers, a modern classical piece, acoustic singer-songwriter solo songs and a fabulous jazz piece with Bill Edgar playing piano, John Patitucci on bass and the incredibly Ruth Naomi Floyd on vocals. 18 songs in all — what a great bonus for those who buy the book. interesting topics and some pretty stellar authors. We were imagining all the grand authors lined up at the edge of the stage for a communal bow. (I don’t know who these folks are below, but you get the picture.) They’ve got their arms around each other’s waists, some are sweating under the stage lights. A few are holding back a little, a few are grinning ear to ear. They are all very glad your here. They do indeed what God to get the glory. Vito Aiuto. He’s friends with Sufjan, who makes a brief appearance in this chapter, is a gentle hipster pastor in Brooklyn, and front man for the quirky neo-folk / quasi-worship band cleverly called Welcome Wagon. He gives us here a truly great chapter on songwriting and it would be excellent for any writer. It is, without a doubt, one of the top essays in the entire book. The first bit about sitting down and doing the work is tremendous — funny, informed, and challenging. And he mentions Robbie Robertson and Paul Simon. His quotes from Annie Dillard are so good. He tells people to read books. His candor about his own discovery of poetry, his guitar playing, his preaching and Sunday evening habits makes it real. I love this chapter! Diana Bauer. This brought me to tears. She tells of great sorrows in her life, reminds us — as if she has to — that most of us living East of Eden share similar sorrows, and she tells how music has helped her through stress and trouble, grief and sadness. She names mostly hymns which touched me deeply, but I’d add other musicians — from Bill Mallonee to Jackson Browne to Switchfoot to the Indigo Girls — who have led me to process and cope with my deepest losses and regrets. This is one of the great chapters in the book and I sincerely commend it to you. Bethany Brooks. Ladies and gentleman, give it up for the gal with the most footnotes! And, man, is she sharp. 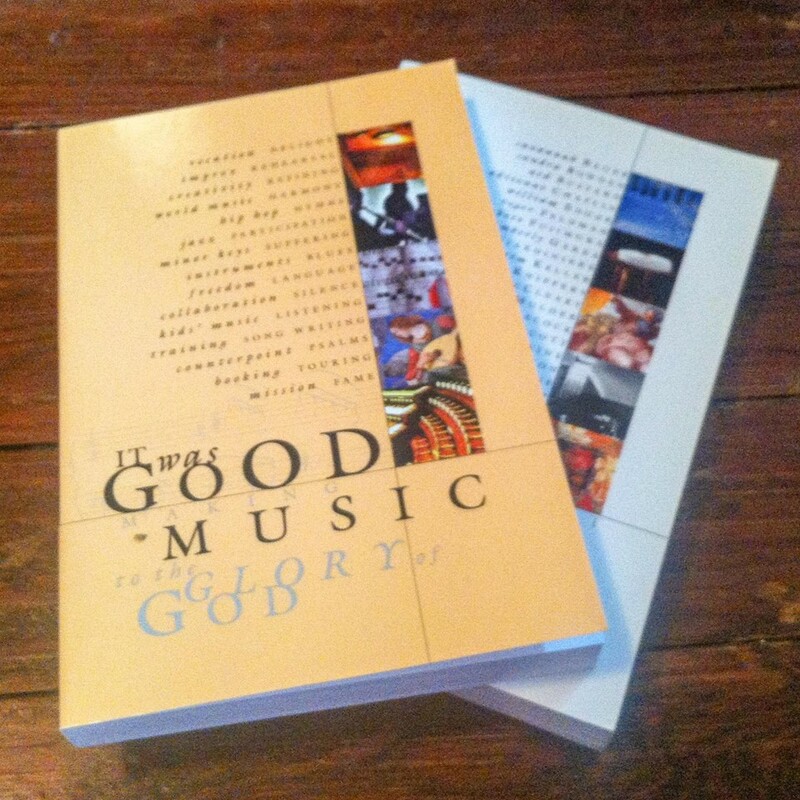 This is a true centerpiece of the book, coming in early, on the theology (and discipline) of delight, the essential aesthetic moment that is art and music. There are various books and resources to explore this essential stuff, and I think her work here is excellent, a fine, needed, relatively short contribution and should become very often discussed. Paul Buckley. The aforementioned must-read piece on the need to sing the Psalms. Some very helpful suggestions, and a guide to recently published Psalters. Very impressive; by the way, he used to be a reporter and has won writing awards. And he’s studied Psalms with the best. Mark Chambers. Don’t let this scare you off, with the transcriptions of lines of score. Yes, he’s a classical buff, and he explains some odd-ball avante garde stuff. Hey, you want to be a life-long learner don’t you? In this exceptionally rich chapter, he teaches us how to listen. Very helpful. William Edgar. He was in the first It Was Good, is a published theologian and scholar of culture and the arts, and a friend to this whole project. His chapter is on jazz, perhaps from a book we pray he will someday publish. This is very, very good stuff, for novices or aficionados. He’s a cat, so you gotta read this! Julius Fischer. Apparently he serves in a small urban church, is a Beatles fan, and tells of playing a hymn with accordion and banjo, and I’m telling ya, this short chapter is everything I love about this cool book. His advise to local church worship leaders — leave the casserole for the pot luck — is priceless. His church is fortunate to have such a diverse, creative, musician but who also understands what worship is about. Ruth Naomi Floyd. Wow. Ruth is renowned as a very cool jazz singer in Philly, and she graces this book with her deep African-American insights about the blues. I am pretty sure I recommended her to Ned as he was searching for excellent authors, and I’m glad she is here. I admire her faith, her character, and her amazing concerts and records. Let the people say Amen! Jan & Mark Foreman. I’m not kidding you — this is worth the price of the book if you are a parent, a grandparent, or know any parents. You may know Mark Foreman’s excellent book Wholly Jesus (I hope you do) but you most likely know of their famous sons, the rock and roll stars of the band Switchfoot. This is a chapter about how to parent kids to be creative, telling how they raised their now-famous sons to be lovers of culture, discerning about the world, and aspiring to excellence. That Jan is a children’s art teacher and Mark a pastor who loves to sing doesn’t hurt. Still, this is inspiring for anyone and a truly wonderful, rich chapter. David Fuentes. This guy does a close reading of a couple of popular songs, wondering about lyric and music, and his insight is as good as it gets. It was so good I had to turn to the back to ask who is this guy? Man, he’s good! He teaches at Calvin College, which, well, explains a lot. Perhaps he hangs around with the aforementioned Ken Heffner. This is a very useful chapter, especially if you work with youth or lead discernment groups or like to talk about evaluating pop songs that you enjoy. Nice! Keith Getty. What a gift this man has given to us, writing so many wonderful contemporary hymns. This chapter comes to us in a fabulous interview format and it is very, very interesting. What a privilege to get to listen in on this as he describes his calling and career in this fine piece. 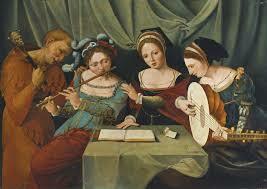 If you don’t know the hymnody of the Getty’s, do check out their work. Steve Guthrie. Certainly this is one of the most significant scholars represented in It Was Good — Dr. Guthrie is a theology prof who earned his PhD from University of St. Andrews and served as a postdoctoral Research Fellow at the Institute for Theology and Imagination and the Arts there. He has written an amazing book on the Holy Spirit (Creator Spirit) and co-edited with Jeremy Begbie the very scholarly collection Resonant Witness: Conversations Between Theology and Music published by Eerdmans.) The maestro could have phoned this in, or written his piece in his sleep, but he obviously didn’t. A brilliant contribution on harmony entitled “The Ratio of Redemption.” I thought maybe it was a typo, but it’s Latin. Excellent. Drew Holcomb. Holcomb loves music, loves live shows, and comes from a family that graciously encouraged his desire to be a troubadour. 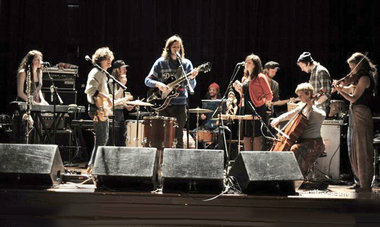 Now he plays with guys like the Avett Brothers and his pals in NeedtoBreath. If you want to know what it is like being a traveling musician, this is a great inside look; he’s a fine writer and this is a lovely chapter. If you are a road warrior yourself, as a musician or maybe even in another career that has you away from home a lot, you should read this as there is much wisdom about maintaining relationships and a faithful spiritual life from this young man. One person said this was one of the best chapters in the book! By the way, one of his songs was used in an Emmy-Award winning TV commercial for the NBA and Sports Illustrated said it was the best sports commercial ever made. So there ya go. Give him some extra applause and buy some of his merch. He’s the real deal. Joy Ike. Joy Ike! I just love this young lady whose name has been shortened from her family’s traditional African name; she is as professional and serious as they come, her commitment leavened, through, by her joyful and Christ-like demeanor. She knows she is called to this work of being a pop music maker and performer and she does it well. Hailing from Pittsburgh, nurtured through the Jubilee conference where she serves in the worship band, getting radio airplay, critical acclaim and mainstream invitations to play at places like Lillith Fare, she is a woman of great grace and maturity and we respect her a lot. But what would she write about, I asked Ned, when he invited her to write. Vocation. Yes! This is perfect for her. It is great to have a working artist ruminating on this foundational Christian truth and what it means to know you are called to this particular work. Tom Jennings. As Music Director of the prestigious and important Redeemer Presbyterian in New York City, I admit to wondering if this would be all that interesting or relevant for those in less influential life locations. He’s a highly regarded classical and jazz musician, and prominent in many ways. Ends up, this was one of my very favorite chapters, which I read twice. It is about rehearsal — and so much more. Wonderful stories, good use of Scripture, theologically mature, and a great lover of his calling as musician — in the recital hall and the sanctuary. Of course, we all have to head to the woodshed, as they say, if we are going to get good at what we do (although he doesn’t use that down-home phrase.) This chapter will make you appreciate rehearsal and practice and collaboration and experimentation and trust and… well, you have to read it! Sandra McCracken. This was one of the first chapters I turned to when I first saw the manuscript, mostly because I so esteem Sandra’s work, from her role in Indelible Grace to her spectacular solo projects. Oh yeah, I thought maybe she’d drop some bit about her hubby Derek Webb. And, again, what perhaps started as cheap voyeurism or fandom on my part ended up being a great reading experience — I will turn to this chapter again, I am sure. Her topic is creativity and it is a wonderful rumination, good for musicians and artists of all kinds, but it is an excellent chapter about being human, finding a life, staying sane, honoring God in the rhythms and seasons of our days. Her title is “Fingerprints and Plumbers” and it is well worth reading. Brian Moss. What a good call to have this wise and important worship leader in here, although it is curious. It is a short piece, inviting us — at the start of the book — to appreciate silence. Moss does some good teaching about our longings for silence, reminding us of the Biblical mandates to keep silence, and invites readers to close the book and experience the lack of creative music-making. Very impressive. I’d invite you to give him a round of applause but, uh, maybe that wouldn’t be right. Stephen Nichols. Now this was a surprising chapter. It was to be on fame and I figure that anyone in the performing arts — or in business or in ministry, even — may struggle with this. And it is exactly that. By way of the true story of one Johnny Cash. Nichols is a great biographer (his latest is on Bonhoeffer, by the way) but he loves popular culture and has a good book himself on the history of blues music. This was a fabulous way to end this fine book. Yeah! Brad O’Donnell. As an impromptu writer and public speaker I sometimes worry about not having time to re-write my work. After reading this wonderful chapter, I want to think more, and do more, in refining, which is O’Donnell’s good theme. He uses the Bible well, makes great points, and then tells lots of great little stories — he studied jazz at the University of Miami Music School where he met Pat Metheny, he cites John Updike and includes a small bit of an interview with Hemingway (yes “that” Hemingway.) He draws on insights by Jon Foreman and evaluates other award-winning musicians (including several Dove Award-winners such as Chris Tomlinson.) What a great chapter, interesting and wise and important for all of us. John Patitucci. Again, what an amazing thing, to have a Grammy-Award winning jazz bassist, a serious man of faith, offering solid insights here. Way to go Ned Bustard, way to go Square Halo. And many thanks to the famous Mr. Patitucci for agreeing to do this good work, writing, teaching, explaining, sharing insight about improvisation. How cool that he opens with Proverbs 27:17– and calls us all to lives of interrelationship and trust and risk and playfulness. John Patitucci is certainly one of the most renowned musicians in the book, and yet it is also one of the most carefully explicating the Biblical text. So cool. Charlie Peacock. Charlie is an old friend of Ned & Leslie Bustard — a mentor and supporter in many ways — and it is no surprise he agreed to revisit his story as young rebel rock star, early pioneer of innovative Christian rock and pop, his being signed to Island Records (at the same time as his label-mates U-too-know-who released Joshua Tree, causing him to get lost by the label) and his journey towards a more public sort of work, guiding and producing some of the most significant rock acts of our time and founding The Art House. He does not draw undue attention to his help with the likes of Switchfoot or The Civil Wars or the Lone Bellow but his story of working out his calling is well told and fabulously interesting for those who have followed his long and impressive career. I like this kind of stuff, and found it to be tremendously enjoyable to listen in to the tale that, by the way, is surely not yet over. Doug Plank. I said everybody was standing on the stage together, taking a big communal bow. 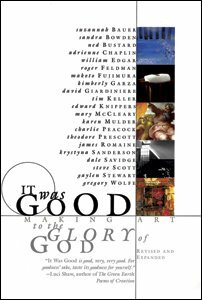 Each author and artist in this book make a unique contribution, yet they hold together in some broad Square Halo vision, taking in both world and church. This is one of those — citing Irish rockers U2 and Reformed Scotsman Carl Trueman — writing about our world’s deep brokenness and the need to honor and attend to that, even in our worship. Plank oversees the worship ministry of a church here in central Pennsylvania and says he loves Tolkien. It makes sense that he is such a reader of JRR’s powerful vision; he is a good thinker, and yet simply calls us to sing from time to time in the minor key. I wish more pastors and church musicians pondered this. Hiram Ring. I hope you know this young singer-songwriter, and I am glad he is in this collection (and on the Noisetrade piece.) It is a chapter I trust you will enjoy and I know you will benefit from reading it. He was born of missionary parents in Africa, so is what they now call “third culture kids.” His music isn’t “world beat” but his themes and topics, coming from his experience and passions, are clearly global. His chapter is called “language” and his love for words, and his passion for translation and his missionary heart is evident. An educational and challenging chapter! Michael Roe. Formerly of the pioneer rock and roll band the inestimable 77s, and then of Lost Dogs fame, Roe is one of the best guitar players I’ve ever come across, and his solo work — recordings and live shows — are breathtakingly good. He’s gritty and raw and a bit grizzled from years on the road. His faith and passion shine through in these two interviews well-conducted by fanboy Bustard. I have to admit, this was the second or third chapter I read, as I just had to see where the conversation would lead. It was not exactly explosive, but it was fabulous — his bit about his jangled rock ‘n roll “nerves” and his love for Mozart and Segovia spoke right to me! What he got at, though, was collaboration, and it was wonderful. Kudos, Ned and Mike. Good collaboration. Michelle Stearns. Give it up, folks, for Chelle Stearns! Or, better, don’t clap for her — clap for yourselves. She writes about participation, about being amateurs, about the joy of doing music, one and all. I was almost scared to read this — don’t ask me why, but I don’t like to dance and I don’t want to have to sing along — but, wowie, I loved it. A very strong chapter which was a joy to read, a treat to think about, and a righteous reminder. Rock on. Gregg Strawbridge. Strawbridge is a heavy-weight thinker, Reformed as the day is long, and appropriately — as the best of the Reformed vision would have it — down to Earth. His church grows their own grapes so they can make their own communion wine. His study here is on church music and why the Bible insists on us using a variety of instruments. Before he gets there, he can’t help but tells us a bit about his own background of loving music — what fun! — and then he does the in-depth, high-quality Bible study that a book like this calls for. A Christian philosophy of aesthetics that can shape a view of music, that can lead us to certain musical practices is the under-girding project of some of these chapters, and no Christian philosophy or worldview worth its salt can avoid the exegetical work. Kudos for this strong chapter about Scripture. Greg Wilbur. Dig this. Wilbur, in his chapter “Throw Back the Clock” teaches us wisely in theological frame, about counterpoint. He writes of those who misunderstand this musical feature in older music, “(these attitudes) fail to recognize the intent, purpose, and structure behind sixteenth and seventeenth century counterpoint or why it fell out of favor in the Age of the Enlightenment. 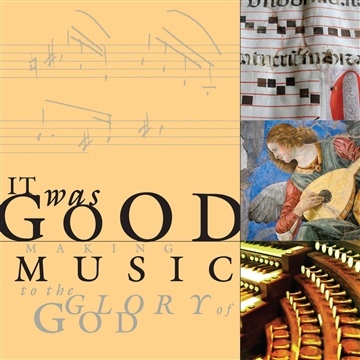 In fact, the demise of counterpoint in the history of music is more an indication of shifting theological worldviews than musical tastes.” This ends up being a bit about Bach, and you simply have to read it — I had no idea. Got my money’s worth right here in these 8 dense pages. Kirstin Vander Giessen-Reitsma. For sheer wordsmithyness, I think this is one of the very strongest chapters, and because she is my friend, and I’ve followed the project she writes about — the Calvin College SAO concert series and their mission of cultural discernment — I have to say it was my favorite chapter in the book. There is such a robust view of culture, such an (underlying, undeveloped, but palpable) aesthetic theory, such a vision of God’s Kingdom coming, even in the popular arts as we learn to think redemptively about entertainment and contemporary live performances. Buy the book, read this chapter, and praise the Lord that some Christians who are booking bands would rather have thoughtful, Biblically-literate excellent, soul-provoking music by the unchurched likes of Lupe Fiasco or the Indigo Girls or The Head and the Heart or Andrew Bird rather than a warmed over, overly pious, derivative prima donna Christian rock star any day. 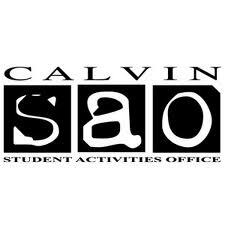 It was a stroke of genius to include the Calvin College story here — it needs to be understood and appreciated as few Christian colleges dare to be as intentional and thoughtful about this — and it fills out the book with broad Christian vision and with solid, practical detail, about hosting shows and learning the Christ-like art of genuine hospitality (for artists and audiences.) Three big cheers. And, I’d shout, “Encore!” More, KVGR, more! And, certainly, we can cry “encore” for Square Halo Books, too. May their generative output — classy, fun, righteous, and seriously meeting a need in the publishing marketplace for evangelical reflection on and exhibits of the arts — continue. God bless them! And God bless you if you buy books like this, keeping artful, indie publishing alive and well.